Kalani Brown tries to score over Erin Boley and Ruthy Hebard. Photo courtesy of Baylor Athletics. 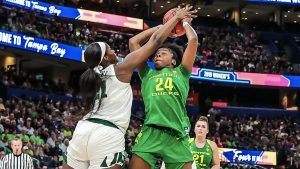 Tampa, Fla. – The Baylor Bears used tough defense down the stretch Friday to get by Oregon, 72-67, and return to the National Championship game for the first time in seven years. Kalani Brown led Baylor with 22 points, Lauren Cox scored 21 points and grabbed 11 rebounds, and Didi Richards added 15 points in a back-and-forth match up that marked Oregon’s first appearance in the Final Four. 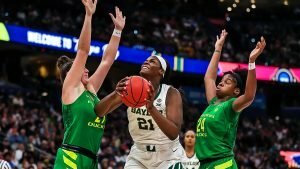 With a 66-all tie at under three minutes to go, the Bears forced the Ducks into missing 12 of their last 13 shots, and one of the best three-point shooting teams in the country was held to 37 percent. The win was the 28th straight for Baylor, which lost only once this season. 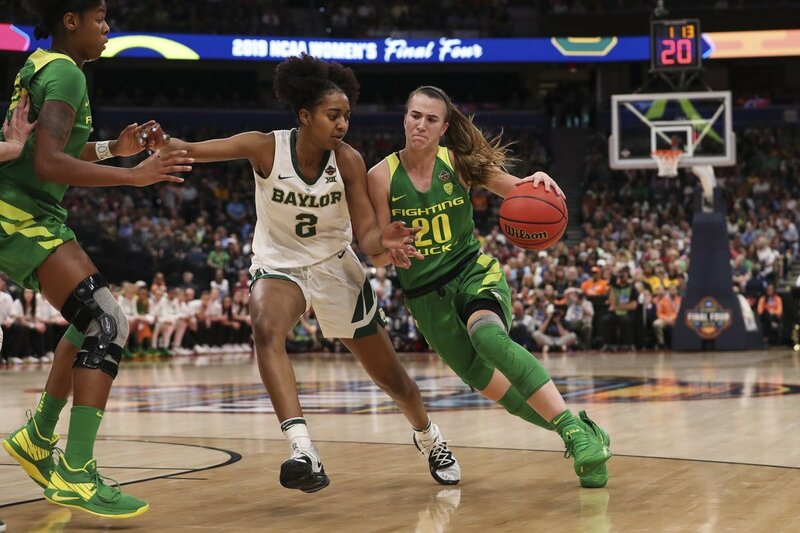 Sabrina Ionescu had 18 points for Oregon, while Satou Sabally scored 16 and Erin Boley, 14. 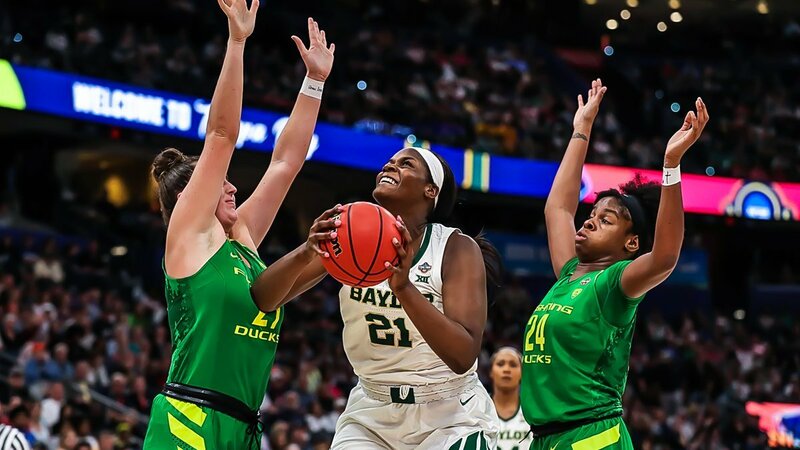 Bears coach Kim Mulkey credited her team’s defensive effort and offensive execution, as well as the leadership from experience of the upperclassmen when they were down by three late in the final quarter. Sabrina Ionescu drives by Didi Richards. Photo courtesy of Oregon Athletics. Though they hadn’t been challenged in a while, they had experience to fall back upon. Kalani Brown fouls Ruthy Hebard. Photo courtesy of Baylor Athletics. Ionescu said the Ducks weren’t able to respond to their opponent’s pressure as they game went on. Baylor will play Notre Dame in the title game at 3 p.m. PT/6 p.m. ET Sunday.